Captain's Blood came with a novella titled The Ark According to Captain Blood. 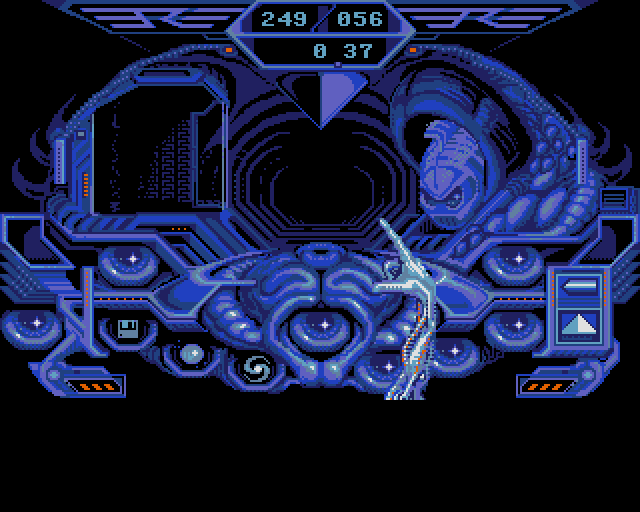 This explained the story up to the point of the game's beginning and revealed that it had a lot in common with the Disney film Tron; something a player of the game would never know without reading the Novella. "This eccentric and comical story explains the bizarre conception of Captain Blood and the otherworldly journey of his obsessed progenitor, Bob Morlok. 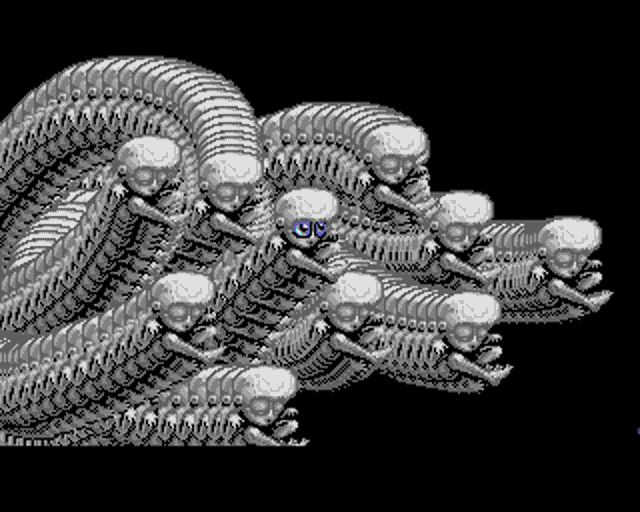 Absorbed into the diseased universe he created for a videogame, Bob becomes an aspect of Captain Blood's bio-consciousness. When a failed hyperspace jump cones 30 copies of the Captain, the mission begins to reclaim them and restore the vital fluids used to make the "Duplicates" to the original Blood. Along the way, Blood encounters a female Oorxx and his ship dissects its genes to install an on-board birth ramp for controllable bio-missiles Blood can use to explore the galaxy more efficiently. After 800 years of searching, only five "Numbers" remain, but they've been tipped off by a Migrax and hidden themselves away. This is where the novella ends and the player takes over Blood's nightmarish fate." 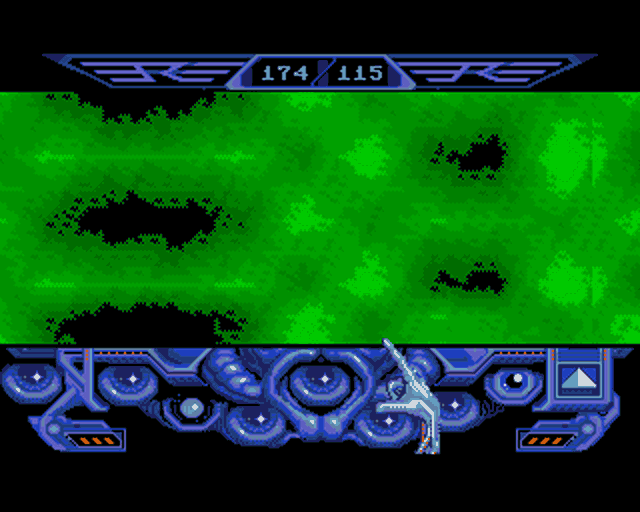 The game Dune, published by Cryo Interactive Entertainment, has a very similar feel to the gameplay of Captain Blood. That is because the developers Exxos later went on to form Cryo as so were part of the same development team. The audio for Captain Blood was stored as standard sample files on the disks. This made it possible to copy the audio samples from the disks and listen to the Jean Michel Jarre music outside of the game. When you encounter a particularly friendly alien, ask it the following question using the alien icons "CODE GG1". The alien will then give you co-ordinates of another alien called GG. Go to the specified planet and you can then ask GG for the co-ordinates of all the other aliens around, by asking "CODE INFORMATION HELP"
If that doesn't work, replace 'HELP' with the name of an alien. 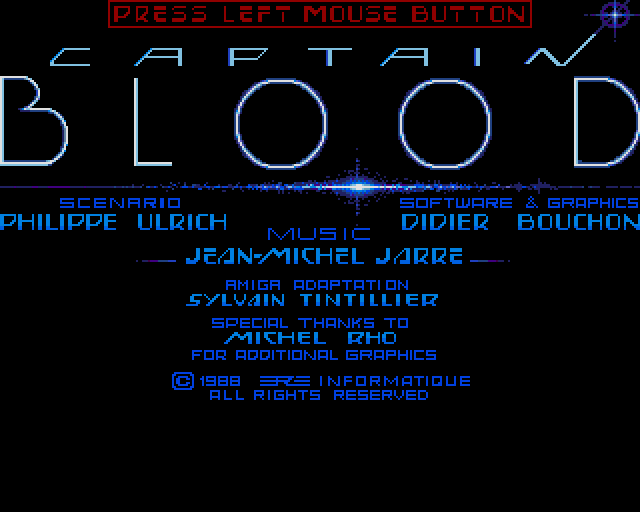 Captain Blood is a game I was hooked on at the time, not least because its musical score was by the famous French musician Jean Michel Jarre, an artist I had become a big fan of at the time, but also because of the intriguing and unique gameplay. I even managed to eventually complete the game after many attempts and at the time this felt like a huge achievement. This is a fascinating space based game, where you take on the role of Captain Blood aboard a massive living space ship called the Ark. It centres on space travel in a galaxy populated by 32,768 planets, many of which are populated with alien creatures that you can have conversations with. But due to the huge number of planets in the game?s universe most of them are uninhabited, so just randomly going to any of them is not a good idea as it is a quick way to get completely lost. Before the game begins, an accidental cloning process has happened aboard the captain?s ship and has drained him of his essential life juices. He is dying and the ship tries to help by replacing his damaged body parts and organs with cybernetic components, linking him inseparably to the ship. This is only a stop gap though because without further help the rest of his body will slowly fail, the ship continuing to replace the failed parts, until eventually the captain will be gone, the only thing remaining will be his consciousness as part of the ships systems. This means that you as the Captain have a finite amount of time remaining to save yourself before your life as you know it is over. The only way to beat this happening is to restore the life juices you have lost by tracking down the 5 remaining clones of the captain which have become scattered across the galaxy, their locations being on any of the 32,768 planets in the games universe. Once found you have to convince them to each teleport back to your ship where you can then extract their life juices and use them to regenerate yourself. The game heightens the urgency of the captain?s plight as the game progresses. You constantly have a timer counting down to zero and as you run out of time, and the ship starts to replace more of the captain, he starts to become physically harder control. This is achieved my making the mouse pointer (the captain?s hand) harder to control, with it shaking or responding in an erratic manor, making it harder to click on controls or to navigate the conversation icons. The game is mainly a detective game, where you have to visit each planet and talk to the inhabitant, trying to gain information from them to try and discover coordinates of other inhabited planets, as well as clues to the location of the actual clones. During the game you have to complete tasks for some of the creatures you encounter in order to gain more information from them. Transporting them to another planet on the promise of information on arrival, visiting a series of other planets on a quest, eventually returning to the first inhabitant once complete, or the destruction of rival planets in return for information, although talking to the inhabitants of the planets marked for destruction can often turn up more information or twists in the plot. 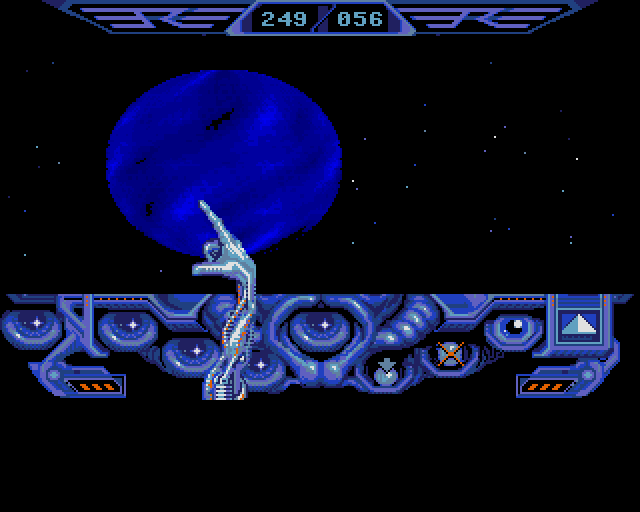 The game's controls are mouse driven and centre around the interface of the Ark, with the mouse pointer being the captain?s hand. 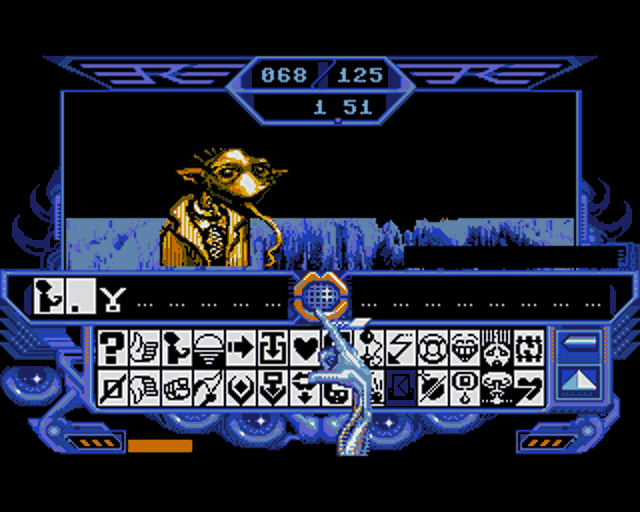 As the game progresses and the ship begins to take over more of the captain, the hand slowly changes from an organic hand and arm, to one of cybernetics, and as mentioned earlier the hand slowly becomes harder to control as the game progresses. Due to the ship taking over the captain he can never physically leave the ship. Instead the ship gives birth to organic missiles called Oorxx. These can be sent down to each planet to locate and communicate with the inhabitants and to teleport any willing inhabitant to the ship where they are stored in cryogenic stasis. While stored in the ship the captain can choose to drop them off at another planet, or destroy them, extracting their life juices to temporarily extend his life a little longer. 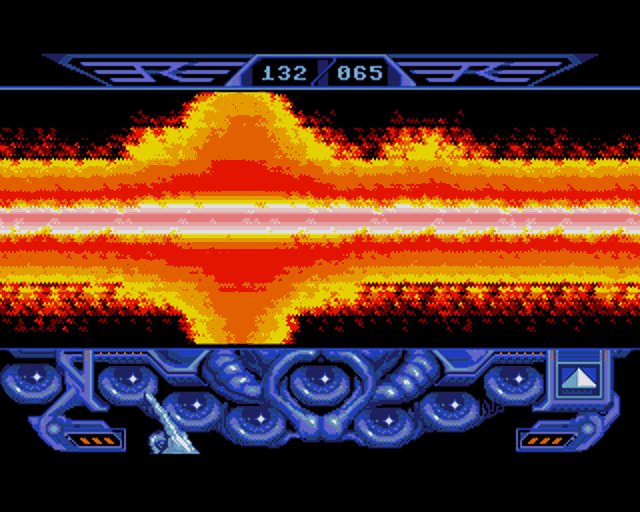 These Ooraxx missiles also have the power to destroy a complete planet if needed (which is a part of the game?s plot later on). 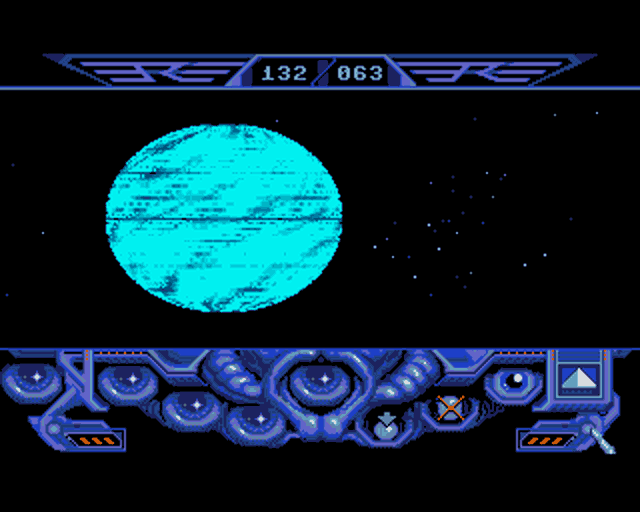 Sending an Oorxx down to a planet gives the player a mini game where they have to navigate the missile through a 3D landscape until it encounters an inhabitant and automatically lands. 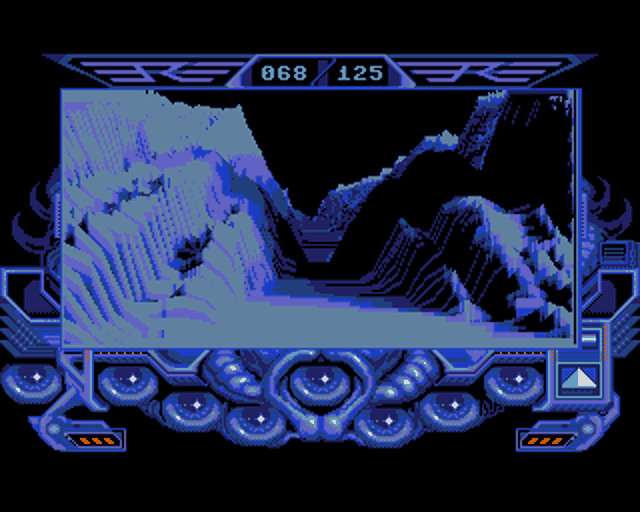 This 3D flying mini game was very impressive at the time, using a black and white vector visual style similar to a 3D sound wave generator or a height mapping system that was very effective in giving the illusion of flying through a 3D landscape. If an inhabitant is found, the view changes to the conversation window where you get to see what they look like. These conversations are icon driven with both the player and the inhabitant conversing using 150 speech icons. This system worked very well and is a fascinating central aspect to the game. At the time this game was released most games used a basic threaded conversation system where you just picked a sentence from a series of options to get a predetermined reply. Being able to construct sentences from an icon library of 150 icons was amazing at the time and worked very well. Sadly this idea hasn?t been adopted much since and many games still use the dated threaded sentence picking system for conversations. This game is very unique in nature. 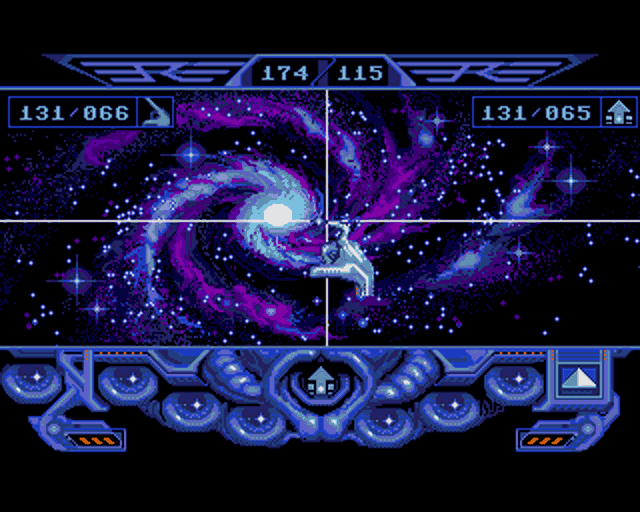 The games interface and space setting are visually well designed with each planet having a unique and often beautiful view from space. 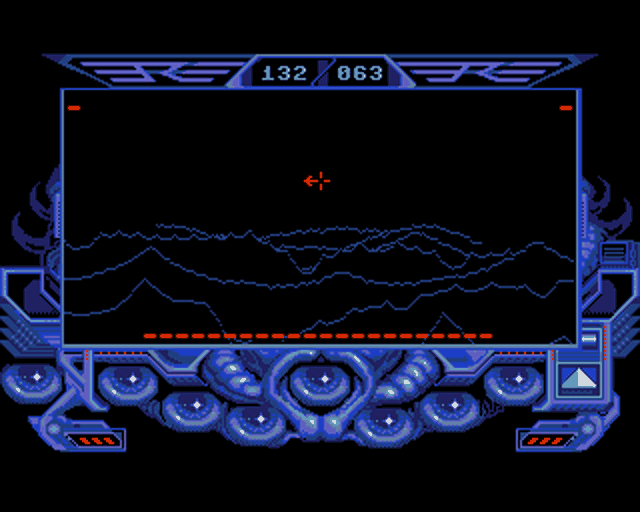 The flying sequences as mentioned before also uses a unique vector style that is very unique to this game and gives a unique sense of depth to the flying experience. And overall the graphical quality of the game's graphics give it a unique and interesting identity that is hard not to like. The actual core of the game is the detective work you have to conduct though the many icon driven conversations you have with the occupants of each planet to piece together the puzzle and eventually locate your missing clones. This makes the game is very intriguing and fascinating experience to play. You do need some patience to play it through to conclusion though, which is why I gave it an 8 for Gameplay and not 10, but I personally found it worthwhile and an enjoyable experience. Equally I only gave it 6 for lifespan because it only has the single storyline, that once completed is the end of the game, and would not offer much extra if replayed.